Salem, OR, February 18, 2018 --(PR.com)-- Ancient history is… well, pretty boring to most people. But what if you were the one who created it? Atlantis, Egypt, and Greece are just a few of the stops these kids will make, always with the promise they could return home when they want. Would you place your life and your friends’ lives in the hands of the gods? 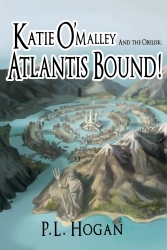 Katie and her crew have been sucked back in time to the ancient island of Atlantis. Little do they know that this is only their first layover in a trip that spans thousands of years. Could you do as well as this handful of teenagers, convincing the great kings of powerful civilizations on the appropriate course of action? You just might need a little more help from the goddesses than these kids do. Visit www.katieomalley.ning.com, where you will be able to ask the kids anything about their travels. They eagerly await your questions.